Xavier Siemens is interested mostly in gravity wave astrophysics, early universe cosmology, especially cosmic strings, and biophysics. He also works on calibration of LIGO data, which is experimentalist work. 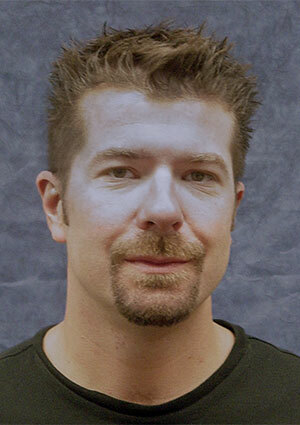 Xavier Siemens received his MSc in Physics from Imperial College (UK) in 1995 and his PhD from Tufts University in 2002. From 2002 to 2006 he was a postdoctoral research associate at the University of Wisconsin-Milwaukee. Siemens then went to the California Institute of Technology, where he worked for a year as Senior Postdoctoral Scholar. Since 2007 he has been at UWM, where he holds the rank of associate professor. Professor Siemens has been a member of the LIGO Scientific Collaboration (LSC) since 2002 and he is part of the LSC burst search group, neutron star search group, and publications and presentations committee. He is currently Co-Chair of the LIGO Scientific Collaboration’s Calibration Team. Siemens leads the Arecibo Remote Command Center at UWM (ARCC@UWM). As part of this project, he mentors undergraduate students in research related to radio astronomy and gravitational wave detection and organizes weekly Astronomy Club meetings. L. Leblond , B. Shlaer, and X. Siemens. “Gravitational Waves from Broken Cosmic Strings: The Bursts and the Beads,” Phys. Rev. D 79, 123519 (2009). M. Anholm, S. Ballmer, J. Creighton, L.R. Price, X. Siemens. “Optimal strategies for gravitational wave stochastic background searches in pulsar timing data,” Phys. Rev. D 79, 084030 (2009). B. Abbott et al. [LIGO Scientific Collaboration]. “Coherent searches for periodic gravitational waves from unknown isolated sources and Scorpius X-1: Results from the second LIGO science run,” Phys. Rev. D 76, 082001 (2007). X. Siemens, B. Allen, J. Creighton, M. Hewitson and M. Landry. “Making h(t) for LIGO,” Class. Quant. Grav. 21, S1723 (2004).